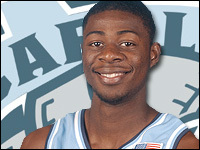 Adam Lucas published an insightful profile of senior forward Deon Thompson on Tarheelblue.com over the weekend. The article discusses the myriad ways in which Deon has played second fiddle during his illustrious career: acting as one half of the Alex Stepheson/Deon Bash Brothers his freshman year, then having to Garfunkle his way for two years behind Psycho T. Deon even gets seconds here on The Rafters due to our extreme love of Ed Davis. That sort of defensive presence is a necessity, especially considering the high volume of turnovers the Tar Heels are consistently coughing up. While Davis and freshman John Henson come up with the most spectacular blocks, Deon continues to execute the less glorious maneuvers – like hedging on screens and closing out perimeter shots – that enstill an underlying defensive toughness. So far this season he has been the Tar Heels’ leading scorer, and is showing some new moves with the same fluidity his game has always exhibited. Here’s to hoping that Deon’s performance thusfar is the prelude of a well-deserved starring season. Seth Davis just put up his predictions for the ACC/Big Ten Challenge over at SI.com and has UNC with the win over MSU. He also has the ACC prevailing 6 games to 5. Bold prediction, I’m not as comfortable saying that after watching some of the others in the ACC play this year. On a neutral court and a 10-game series, I would go with the Spartans. 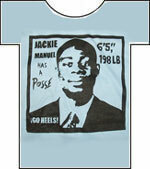 But since the game is in Chapel Hill, I’ll give the edge to the Tar Heels. Michigan State is much stronger on the perimeter, but the Spartans are a short team, and the one thing North Carolina has is a lot of size inside. 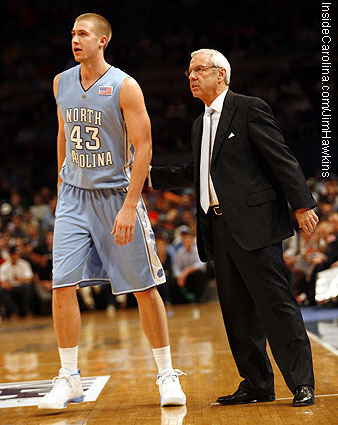 The big question will be whether the Tar Heels’ defense can hold down Michigan State’s impressive field-goal shooting. I’m hoping for that outcome as well. Skinny: This is a classic case of preparation meeting opportunity. 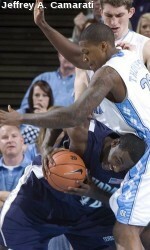 With Ty Lawson running the point last year, no backup, especially a freshman, was going to get a lot of minutes. Even when Drew was in the games, he looked shaky, but it was hard to tell whether that was because he couldn’t get into a rhythm or he wasn’t that good. Now it looks like it was the former. 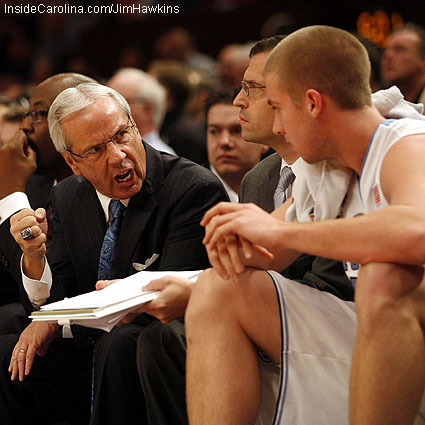 Drew has proved he can run North Carolina’s offense with efficiency and effectiveness, which is not easy to do with so many newcomers running alongside him. His assist-to-turnover ratio is nearly 2-to-1, and his improved field goal percentage reflects his confidence knowing the starting job is his. And this was written before his 10 assist, 1 turnover and clutch 3s performance last night. Yeah, he’s going to be good. Hope all had a grand Thanksgiving this weekend and caught up on some college sports over leftovers and family time. 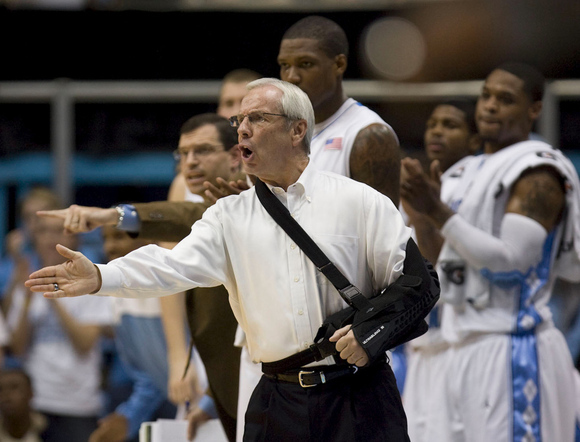 Roy started things out with some minor surgery but was back in action on Sunday night as the Tar Heels took on Nevada. 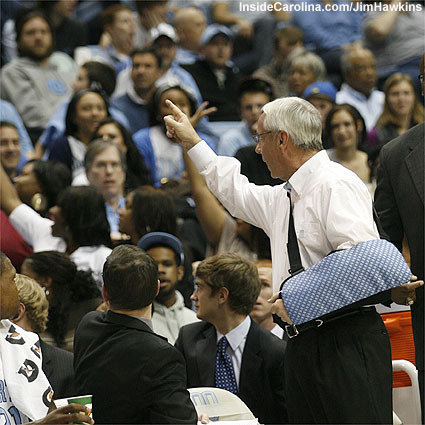 The most interesting part of Roy’s wardrobe tonight wasn’t his tie, which was a simple Carolina blue and white diagonal striped piece, but how Roy went sans tie for most of the game. 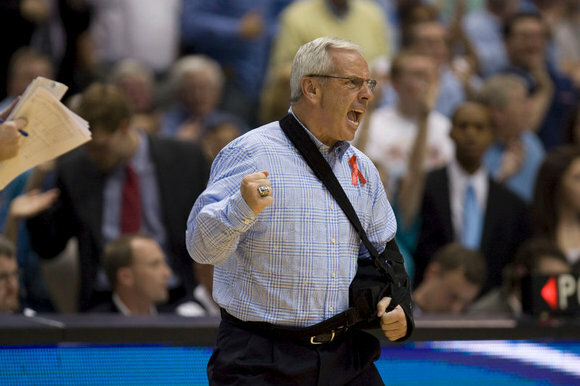 To me, Roy without his tie is like Batman without a utility belt, because much of his power seems to be derived from what’s hanging around his neck. 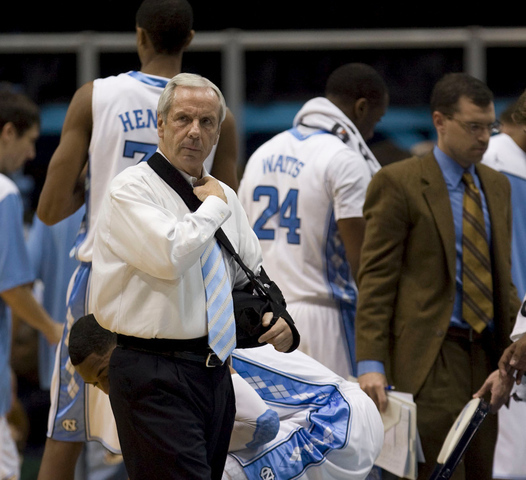 I didn’t mind the casual look, however, as Roy went without the jacket all night as well. But really, you can wear whatever you like if you have 600 wins under your belt. This is all brings up a couple questions. 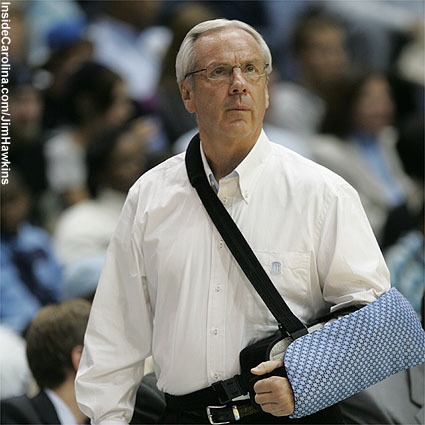 One: Since Roy will be wearing the sling for the next four weeks [we hope not more, Roy seemed to tweak his shoulder during the game], does that mean no jacket or, eek, pocket square for that long as well? 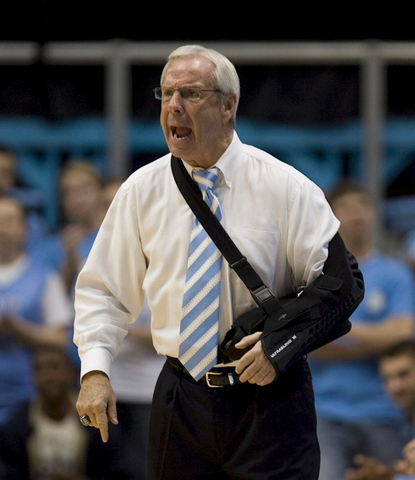 Roy never appeared with one tonight and it would make sense. 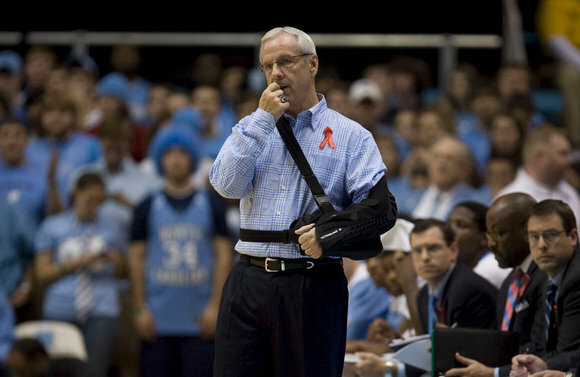 Two: Roy looked to not be feeling the tie underneath the sling, as apparent by him removing it, will he do the same Tuesday against Michigan State, or will he just not wear one? 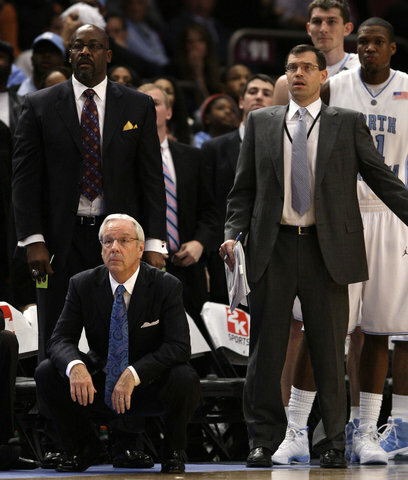 Three: Has Roy ever coached a game without a tie? Do we have documentation? 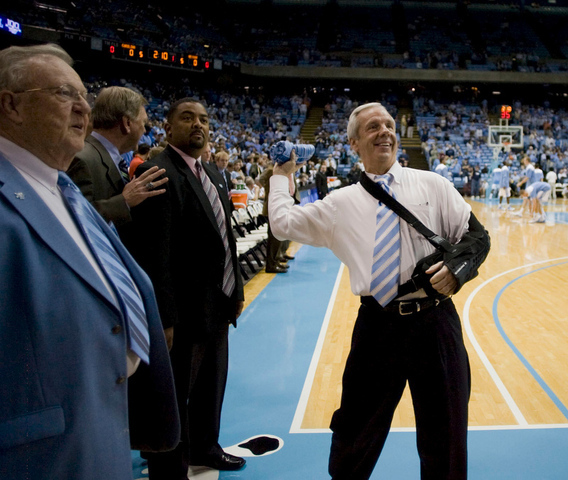 And most importantly, four: Do we like Roy without a tie? 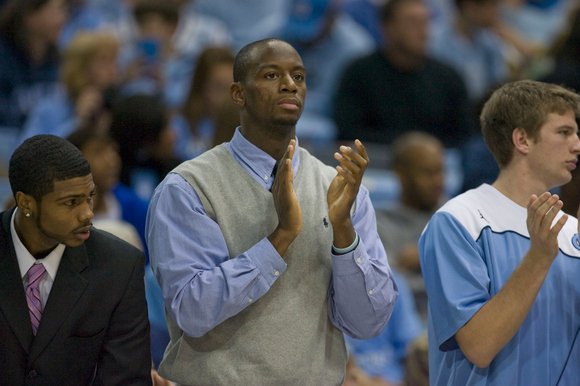 First off, let’s go ahead and give the title of Best Dressed Coaching staff to the UNC bench. Very well done gentlemen. 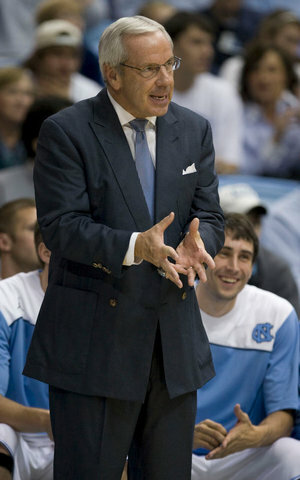 Onto tonight’s matchup against Gardner-Webb, Roy matched up a blue and white dotted beauty over a white shirt. 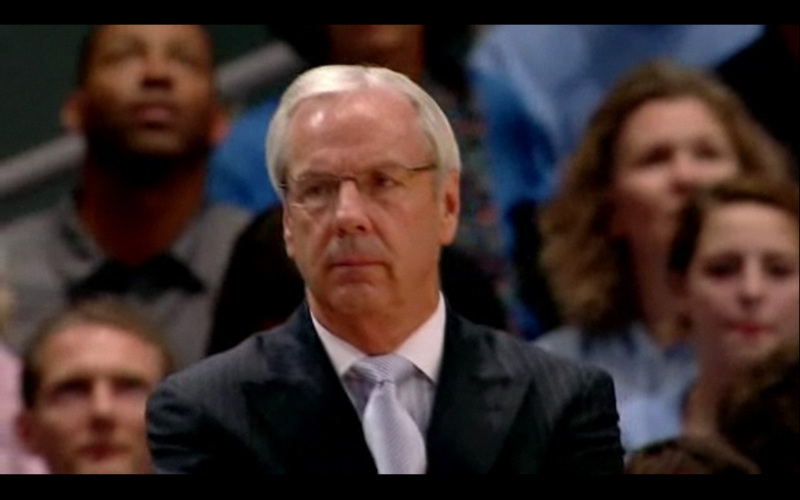 One of the more toned down of Roy’s choices thus far this season. 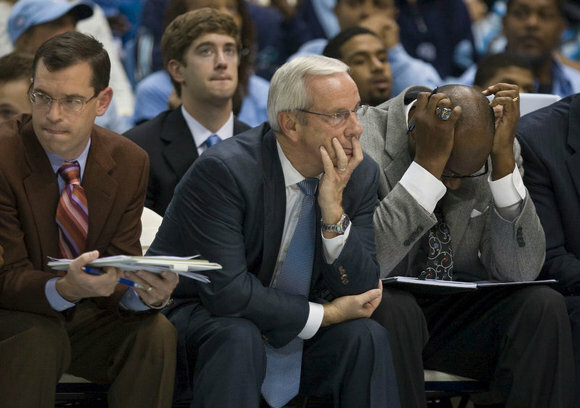 Roy chose a blue suit and also went big with the contrasting buttons. Sharp look. Let’s all take a trip down memory lane and avoid as many cliches as possible. 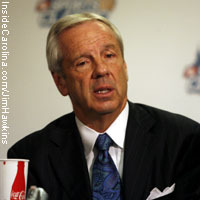 The year was 2005 and UNC had just won Roy Williams his first NCAA championship. That June, UNC would make history with four players selected in the first 14 picks of the NBA draft and one more being picked in the second round. One notable exception from that list of draftees was shutdown man Jackie Manuel. 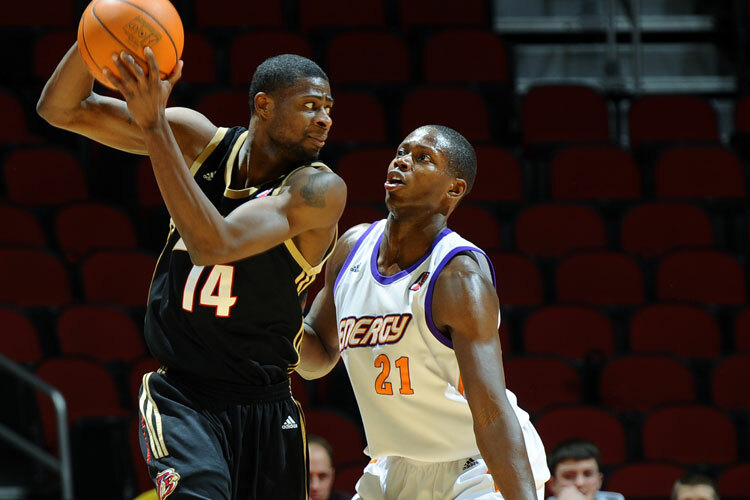 Jackie has forgone the usual route of playing oversees and now plays with the Erie BayHawks of the NBA D-League. 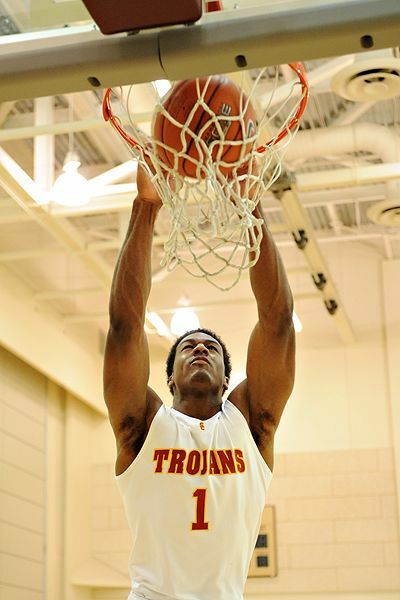 Last season Jackie averaged 9.1 points and 7.1 rebounds and shot 47.9 percent from the field as a starter. Over the off-season Jackie has changed up his diet, added close to 20 pounds of muscle and worked to improve his shooting touch. He was an abysmal 27.3 percent from beyond the arc and 59.2 percent from the free-throw line. 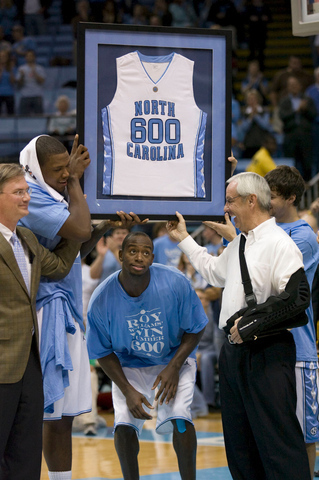 Here’s to you Jackie, good luck in Erie and remember you’ll always have a possee in Chapel Hill. Well, the finals outcome wasn’t the way we wished it would have been, but Roy was in top form for two days in Madison Square Garden. 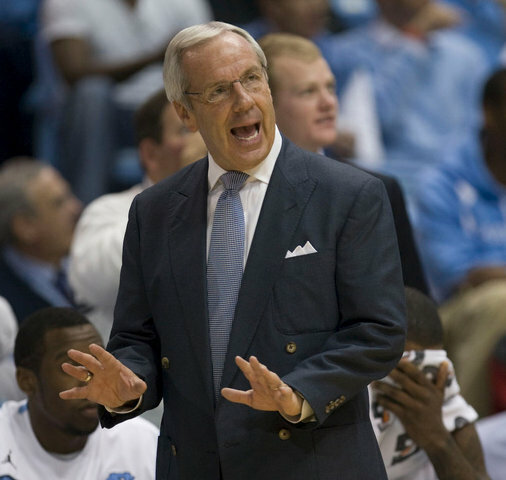 On Friday, Roy brought out what looked to be the same tie for Ohio State that he wore during his ESPN All Access feature: a light-blue with white diagonal stripe. Here’s a look from the All Access piece. It actually looks like exactly the same outfit. I’m surprised Wanda let Roy leave the hotel that way. I just take that as complete disrespect to Ohio State. 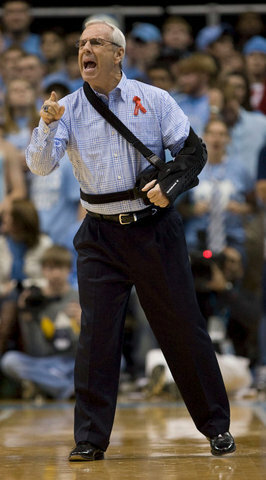 I may have been worried about the game, but Roy doesn’t even bother with a new tie for them. I like the subtle insult. 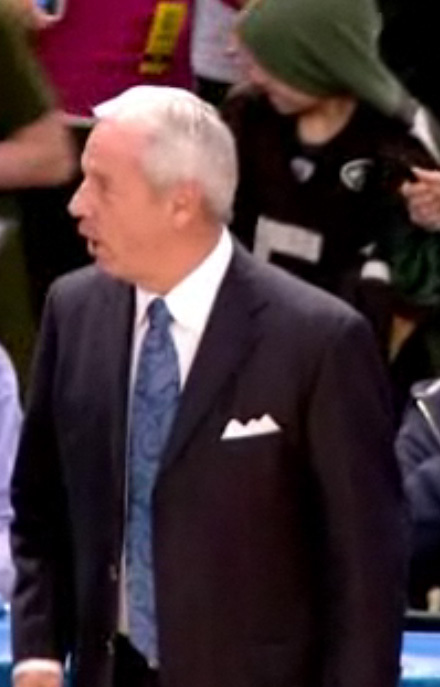 Also, ESPN showed the All Access piece during the game which is interesting. Would have thought it was filmed the same day had I not known better. Almost forgot to note the pocket square and pinstriped suit. Also really like the vertically striped shirt with white collar. Nice contrast. For the Syracuse debacle Roy went back to his standby paisley. Sorry for the lack of good shots, but it’s a navy and Carolina blue large pattern with maybe a hint of accents of a lighter hue. 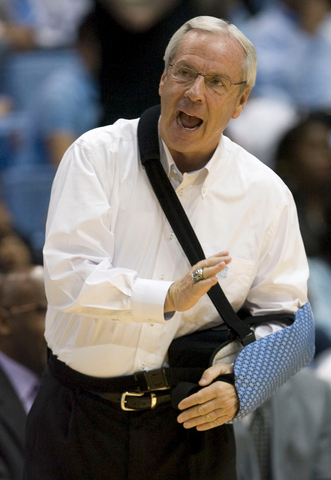 Roy wore a paisely in the first three wins before changing it up for the fourth. After revisiting it, we take the first L.